Superintendent Sue Leabo, Ed. 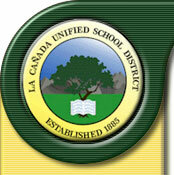 D., has retired after six years of service in the administration of La Cañada Unified School District. Sue first came to La Cañada Unified School District in October of 1999 when she was hired to be the Assistant Superintendent of Human Resources. In 2001, she became the Superintendent of La Cañada Unified School District. The LCUSD community is grateful for her service and wishes her a wonderful and relaxing retirement.